Globe Santa was created in 1956 to deliver holiday gifts to local children in need. 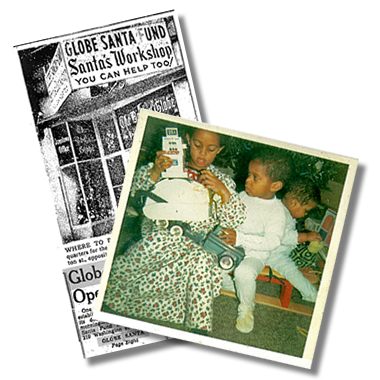 That year, Globe Santa collected $51,000 in donations to help 6,200 Greater Boston area families. The number of families requesting assistance has continued to grow. More than 1 million families and more than 3 million children have been served by Globe Santa during the past six decades. For prior years' information, click here. The good will of the community has always been Globe Santa's greatest strength. Neighbors helping neighbors; families helping families; generations joining together in a tradition shared throughout the Greater Boston community. Visit our Donate page to join in this tradition. Globe Santa exists solely to deliver joy to local children. We do this by providing holiday presents to families in need throughout the Greater Boston area. Through the thoughtfulness of our contributors and volunteers, all donations go directly to support Globe Santa, a program of the Boston Globe Foundation. We are strengthened by individuals, families and organizations that choose to assist their neighbors by joining in this unique holiday tradition. Please make checks payable to "Globe Santa." In person donations can be made at various locations hosting Globe Santa events from November through December. Please check the calendar on the Events page to confirm ways to make your donation.